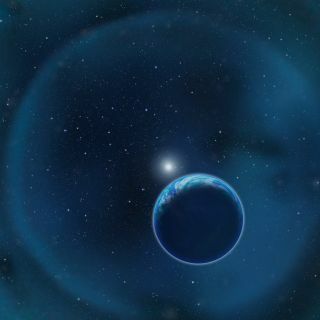 A habitable planet orbits a white dwarf in this artist's illustration. But the search for extraterrestrial intelligence (SETI) has mostly concentrated on "technosignatures," such as radio and other electromagnetic signals that alien civilizations might give off. Now researchers suggest that searches for atmospheric biomarkers could also look for industrial pollutants as potential signs of intelligent aliens. CFCs are nontoxic chemicals that were once used in hairspray and air conditioners, among many other products, before researchers discovered they were causing a hole in Earth's ozone layer, which protects the planet from dangerous ultraviolet radiation. "Very hairy extraterrestrials may be a little easier to detect," joked lead study author Henry Lin, a physicist at Harvard. CFCs are strong greenhouse gases, meaning they are very effective at absorbing heat. This means that if CFCs are in the atmosphere of a distant Earth-size planet, they could alter a white dwarf's light when that world passes in front of that star — enough for the $8.8 billion James Webb Space Telescope (JWST), which is due to launch in 2018, to detect them. "The most exciting aspect of the results is that within the next decade we might be able to search for excessive industrial pollution in the atmospheres of Earth-like planets," study co-author Abraham Loeb, a theoretical astrophysicist and chair of Harvard's astronomy department, told Space.com. Ironically, "aliens are often referred to as green little creatures, but 'green' also means 'environmentally friendly,'" Loeb said. "Detectable CFC-rich civilizations would not be 'green.'" "If we find graveyards of other civilizations, most rational people would likely get engaged in protecting the Earth from a similar catastrophe," Loeb said. "We call industrial pollution a biomarker for intelligent life, but perhaps a civilization much more advanced than us with their own exoplanet program will classify industrial pollution as a biomarker for unintelligent life," Lin said. However, if astronomers discover a world heavy with CFCs that exists outside the habitable zone of its star, that could mean an extraterrestrial civilization may have intentionally "terraformed" that planet, making it livably warmer "by polluting it with greenhouse gases," Loeb said. Scientists have previously suggested terraforming Mars by warming and thickening the Red Planet's atmosphere so that humans can roam its surface without having to wear spacesuits.